Hoolie gets smelly when he’s hungry, and that’s how the boys know it’s time to feed him. He eats clothes, especially socks. Mom and Dad don’t know what is going on originally, but soon they figure out why the family socks are disappearing from the Hooligan house. He has a compartment in his belly, like Mary Poppins’ carpetbag, that can somehow hold an endless supply of neat gizmos and gadgets. The boys can’t communicate with him at first and rig up an electronic device to help them read Hoolie’s mind. 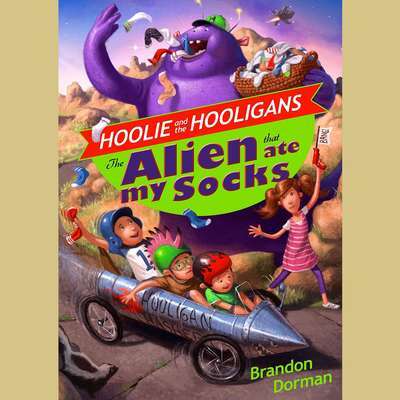 The Hooligan boys keep Hoolie a secret until he saves a neighborhood girl from a burning building and the town befriends him. Then a team of mysterious strangers dressed in black who call themselves “Animal Control” arrive, but the Hooligan boys know this can’t be true. The boys must resolve their problem with Rock, help Hoolie earn his merit badges on Earth, and help him find his way home before “Animal Control” captures him!